I came upon Monika Chlebek’s painting quite by chance. It was a kind of impulse you cannot disregard. A few months earlier I had been reading Olga Tokarczuk’sBizarre Stories and a residue of this reading was still hovering in my thoughts. My imagination continued to set in order the accumulated visions that found their way from stories to dreams … and all of the sudden, as if still borne on the wave of my fascination with Tokarczuk’s prose and in line with the subconsciously still desired logic of suspense, I saw bizarre, Unsettling and Unclear images. They beckoned me to the shadow zone, inviting to enter a space overridden with question marks, a semi-dark brimming with unknowns. The subdued hues, fragments of figures, tenuously implied situations … Disquiet and an uncanny sense of danger, both underpinned by gallows humour. Beginnings of stories that are suddenly cut off, leaving one awed and insatiable. These images cannot be comprehended yet can be strongly felt. 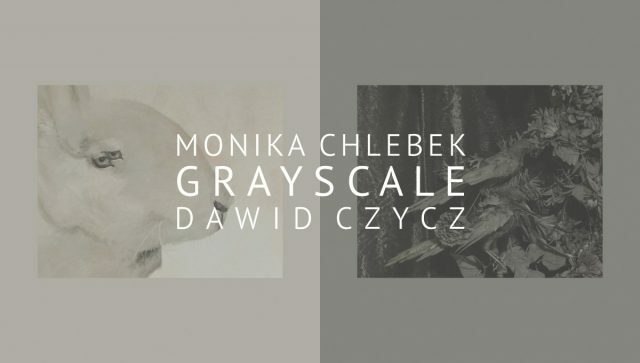 The fascinating texts by Olga Tokarczuk and the unique works by Monika Chlebek contain a mystery which is the cornerstone of the story or at least implies it. This mystery is like a live being from an alternative reality, some seditious fairy-tale gnome that tests the recipients intrepidness and potency of imagination … You can almost hear the deafening giggle … I cannot help thinking that for both authors the voice that dictates successive lines and the gesture that guides the brush across the canvas are – at least partly – a mystery. Asked about the methods of work, Monika Chlebek stresses the role of intuition, although she realises that she runs the risk of being accused of stereotypically acting in opposition to intellect. However, it is intuition that is her compass. When she collects enough energy and the attendant themes, motifs and concepts, she begins to paint. The successive painting is in a way a consequence of the first one; it arises from it, although it does not in any way explain or sum it up. The artist is active until the accumulated energy has ebbed and the topics she addresses have ceased to attract her attention and have lost their potency and freshness. In point of fact, the creation of paintings begins much earlier, before she opens a paint tube or grabs a paintbrush. Paintings are created when she pulls canvas on stretchers, reads books, observes, thinks, and performs everyday activities. As she herself confesses, she spends a lot of time thinking about and zooming in on themes, and although the results of her work are not yet visible at that time, everything that happens at that time is later on reflected in her painting. The artist consciously builds up the tension necessary for the painting process. When the accumulated energy allows it, she carefully rummages through a collection of ideas so that the final choices are not accidental. Monika Chlebek keeps highlighting that what she likes in art, including her own, is the lack of precise wording. She is after understatements; implies but does not continue, abandons the viewer with an unclear premonition, surprised, with all the justified though “ineffable” anxiety. This is enough for her, because she does not want to tell stories that begin, unfold and end. Her stories appear in the form of scattered shards of an unknown whole. And this is a fully purposeful action of the artist, who deliberately leaves gaps in the visions presented and does not want to convey to the viewer specific thoughts or refer to known truths. That is why she considers talking about her own painting to be disproportionate to the paintings, necessarily neglecting them and not reflecting their essence. The emotional load of her works is truly enormous. Monika Chlebek is convinced that she speaks more through her paintings than through her words. In view of this legitimate statement, the curator had better cease using words, too. on 17th June 2017 at 4 p.m. The exhibition is on view until 20th August 2017. Catalogue with my latest works now available! Catalouge from the exhibition “Artists from Cracow. The generation 1980 – 1990”! Art by women painters is currently one of the most interesting manifestations of contemporary art in Poland. This unique phenomenon not only has become increasingly recognizable and distinct, but also the feminist perspective no longer suffices to analyze these works. The exhibition showcases various current artistic pursuits and endeavors: from traditional paintings, through painting projects, to painting and architectural objects. It also includes site-specific works. It is an extensive presentation of works by women artists. Unframed painting interventions made in the corridors connecting exhibition rooms as well as on the roof patio have increased the exhibition space from around four hundred and fifty square meters to almost six hundred and fifty square meters. The exhibition makes an attempt at depicting the phenomenon which has lately started to become a distinct convention observed in Polish contemporary art of the early 21st century. Women’s active participation in art dating back to 1980s is extremely important and undisputed, but it is only now that the men artists’ dominance in painting has been challenged. Parities that so many politicians nowadays are eager to fight for worked pretty well in the Polish art world around thirty years ago. At that time great women artists, including painters, were of course present in the global – and Polish – art scene, but they were uncommon. These days the situation is different. The last ten years in art shows that the medium of painting not only flourishes among women artists but also takes many different forms. Over twenty artists participating in the exhibition represent a wide range of figurative painting: symbolistic, narrative and expressionistic. There are also mural paintings by Sister Michalina, discovered during the recent renovation of the Cultural Center building that formerly belonged to the convent. This exhibition is an interdisciplinary display of possible painting forms. Of course there are certain references to the traditional painting, but these are all conscious choices. These artists deliberately refer to what is already present in art and filter it through their own experience, emotionality, sexuality and cultural awareness. As a result, they create paintings that are different from those already known. Therefore, to read this situation correctly may not be easy, especially considering all the prejudice and still existing stereotypes, including those connected with women’s social roles. It will be crucial then to popularize this phenomenon as a naturally developing area of contemporary art practice. This catalog, along with the extensive illustrative materials presenting works by individual artists, is an attempt to place this unique phenomenon in the broader context of Polish and European art.